This is the twentieth in a series of chimerical creatures; the aim is to create an alphabet of fabulous beasts over the coming months. In Greek mythology, the Titans (Greek: Τιτάν—Ti-tan; plural: Τιτᾶνες—Ti-tânes) were a primeval race of powerful deities, descendants of Gaia (Earth) and Uranus (Sky), that ruled during the legendary Golden Age. They were immortal giants of incredible strength and were also the first pantheon of Greek gods and goddesses. In the first generation of twelve Titans, the males were Oceanus, Hyperion, Coeus, Cronus, Crius, and Iapetus and the females—the Titanesses or Titanides—were Mnemosyne, Tethys, Theia, Phoebe, Rhea, and Themis. The second generation of Titans consisted of Hyperion’s children Helios, Selene and Eos; Coeus’s daughters Leto and Asteria; Iapetus’s children Atlas, Prometheus, Epimetheus, and Menoetius; Oceanus’ daughter Metis; and Crius’ sons Astraeus, Pallas, and Perses. The Titans were overthrown by a race of younger gods, the Olympians, in the Titanomachy (“War of the Titans”). The Greeks may have borrowed this mytheme from the Ancient Near East. Greeks of the classical age knew of several poems about the war between the Olympians and Titans. The dominant one, and the only one that has survived, was in the Theogony attributed to Hesiod. A lost epic, Titanomachia—attributed to the legendary blind Thracian bard Thamyris—was mentioned in passing in an essay On Music that was once attributed to Plutarch. The Titans also played a prominent role in the poems attributed to Orpheus. Although only scraps of the Orphic narratives survive, they show interesting differences with the Hesiodic tradition. The Greek myths of the Titanomachy fall into a class of similar myths throughout Europe and the Near East concerning a war in heaven, where one generation or group of gods largely opposes the dominant one. Sometimes the elders are supplanted, and sometimes the rebels lose and are either cast out of power entirely or incorporated into the pantheon. Other examples might include the wars of the Æsir with the Vanir and Jotuns in Scandinavian mythology, the Babylonian epic Enuma Elish, the Hittite “Kingship in Heaven” narrative, the obscure generational conflict in Ugaritic fragments, Virabhadra’s conquest of the early Vedic Gods, and the rebellion of Lucifer in Christianity. The Titanomachy lasted for ten years. Hesiod does not have the last word on the Titans. Surviving fragments of poetry ascribed to Orpheus preserve some variations on the myth. In such texts, Zeus does not simply set upon his father violently. Instead, Rhea spreads out a banquet for Cronus so that he becomes drunk on fermented honey. Rather than being consigned to Tartarus, Cronus is dragged—still drunk—to the cave of Nyx (Night), where he continues to dream throughout eternity. Another myth concerning the Titans that is not in Hesiod revolves around Dionysus. At some point in his reign, Zeus decides to give up the throne in favor of the infant Dionysus, who like the infant Zeus is guarded by the Kouretes. The Titans decide to slay the child and claim the throne for themselves; they paint their faces white with gypsum, distract Dionysus with toys, then dismember him and boil and roast his limbs. Zeus, enraged, slays the Titans with his thunderbolt; Athena preserves the heart in a gypsum doll, out of which a new Dionysus is made. This story is told by the poets Callimachus and Nonnus, who call this Dionysus “Zagreus”, and in a number of Orphic texts, which do not. One iteration of this story, that of the Late Antique Neoplatonist philosopher Olympiodorus, recounted in his commentary of Plato’s Phaedrus, affirms that humanity sprang up out of the fatty smoke of the burning Titan corpses. Pindar, Plato and Oppian refer offhandedly to man’s “Titanic nature”. According to them, the body is the titanic part, while soul is the divine part of man. Other early writers imply that humanity was born out of the malevolent blood shed by the Titans in their war against Zeus. Some scholars consider that Olympiodorus’ report, the only surviving explicit expression of this mythic connection, embodied a tradition that dated to the Bronze Age, while Radcliffe Edmonds has suggested an element of innovative, allegorical improvisation to suit Olympiodorus’ purpose. Some scholars of the past century or so, including Jane Ellen Harrison, have argued that an initiatory or shamanic ritual underlies the myth of Dionysus’ dismemberment and cannibalism by the Titans. She also asserts that the word “Titan” comes from the Greek τιτανος, signifying white earth, clay or gypsum, and that the Titans were “white clay men”, or men covered by white clay or gypsum dust in their rituals. M.L. West also asserts this in relation to the shamanistic initiatory rites of early Greek religious practices. I like that these would be the smallest bones in the skeleton of a Titan and you show them at “actual size”; I find myself scaling up from there in my imagination and running out of space. 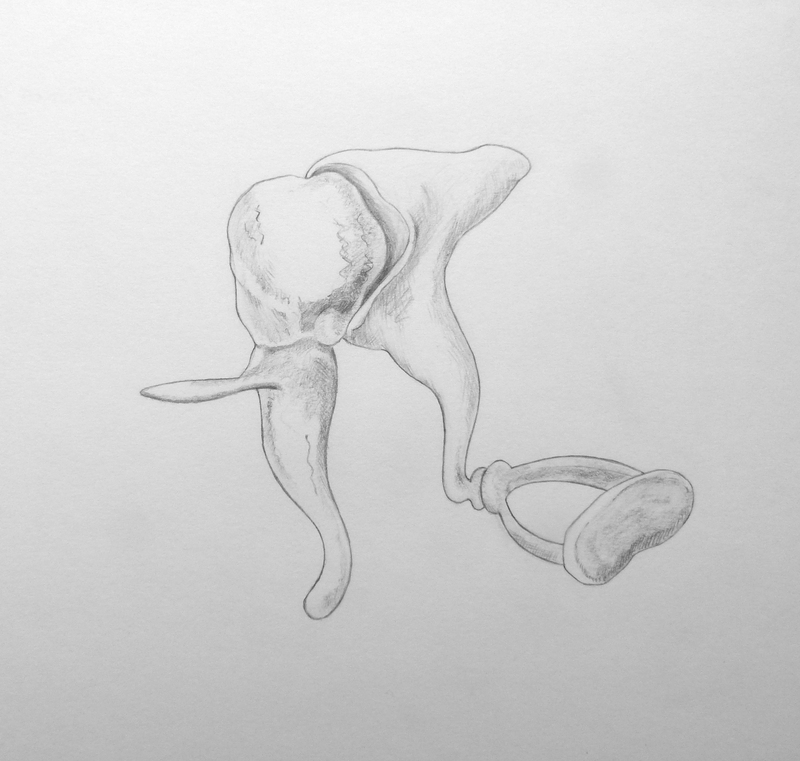 You are currently reading Sketchbook Page 56: T is for Titan at osteography.